Swiftmas came early this year for two Taylor Swift mega-fans! Brittany Lewis knew there was nothing his fiancée, Alexas (Lexi) Gonzalez, loved more than Taylor Swift, and the singer's anthem "Love Story" had become their own personal jam. He even played it at their proposal! So, before his wedding to Lexi, Brittany sent Taylor a bunch of messages asking her to do something special for their wedding. Welp, when a fan asks, you know Tay's gotta deliver! The superstar sent flowers and a note to the couple's January 12 wedding, and of course, they promptly freaked out. 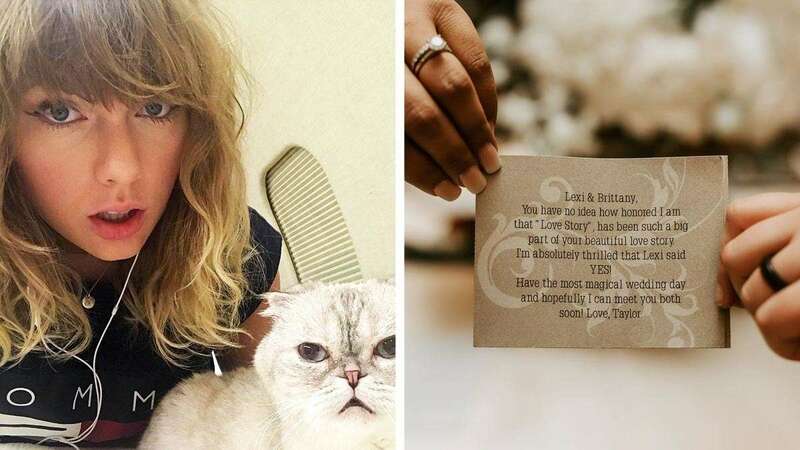 Lexi tweeted out the a pic of her nuptials, the note, and the flowers with the caption, "Still in freaking shock that @taylorswift13 sent me and my amazing Hubby flowers on our wedding day!" she wrote. The note read: "You have no idea how honored I am that 'Love Story' has been such a big part of your beautiful love story. Have the most magical wedding day and hopefully I can meet you both soon!"